The PFF ventured to Kelsey Ranch early in May. Many of the group were first time bass fishers, including our Vice-President Mike McGuire. After a breakfast stop at the Drigger Inn we arrived at the lake. Larry Duarte, Art Kaufman and Dennis Marguete were busy chasing fish by the time the main group finished breakfast and joined them. The weather was almost perfect. 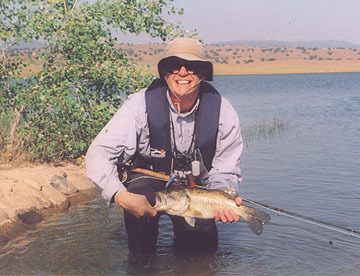 During the course of the day fish were caught, including Mike McGuire�s first bass on a fly rod. It was quite exciting. The bass proved to be difficult and made us work for them, or maybe we missed the early bite. Nevertheless, we pursued the elusive quarry. By lunch time everyone was ready for a break and the BBQ Burgers were a big hit. George Conway, assistant fishmaster, did a great job. Nobody went away hungry. A couple of fly fishers fished right through lunch and came in later to find everything consumed. After lunch we worked even harder for the bad attitude bass, and we found some. George, Larry and Rich got a chance to fish two upper lakes and the creek. The creek held some very large carp which may be worthy of another try. But on this trip we were after the bass. The one upper lake we did fly fish gave up a few smaller fish and may be the focus of this upcoming trip, June 2nd. It�s a long slow drive out the lake. At last count everyone, or nearly everyone, managed to catch or hook a fish, they worked for them. This years fishout did not produce the numbers or fish that were hoped for. Everyone had a good time and looks forward to another fishout.